The IPL fever is on and the whole nation is crazy about it but the one who is winning in the game is Dream 11. While watching IPL you can see its ads everywhere and why not it’s a billion-dollar company with the overall user base of more than 50 million. There are dozens of fantasy games but 90 % of traffic is entertained only by Dream 11. Promotions strategy of Dream 11 plays a great role to achieve market leadership. So, let’s see what are the key marketing lesson we can learn from Dream 11. Currently, Dream 11 is endorsed by MS Dhoni which makes it the perfect choices for the cricket fans, Dhoni is known for his intellectual and winning game strategies that are the main theme to promote. 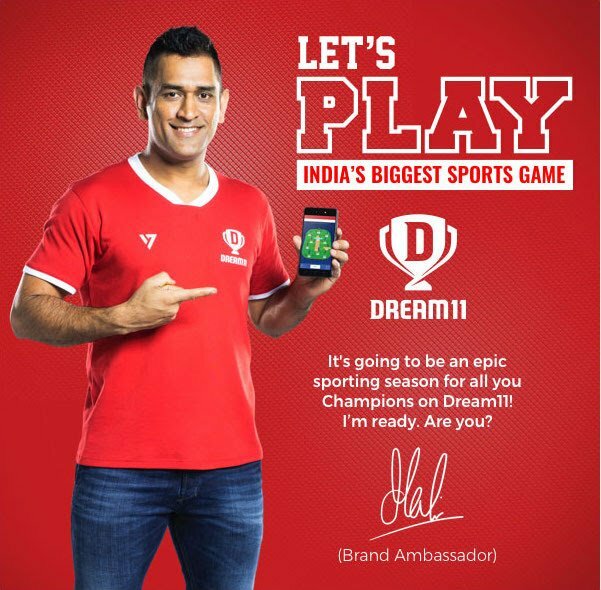 Dream 11 came up with the marketing campaign such as #KheloDimagSe and #DimagSeDhoni which aims to connect with user’s in-depth research, profound sports knowledge and skill just like Mahi. Remember your childhood memories of cricket and the craziness behind it. The same story is created in their promotion’s tagline #YeahGameHainMahan. It ads how Gully cricketers struggled while playing cricket and the happiness attached to it, even the music in the background is so soothing that it makes the perfect match to give us a nostalgic feeling with an emotional touch. Marketing is all about timing and opportunity. Cricket fever in the fans is at peak due to IPL followed by World-Cup. So, what’s next? Dream 11 took this golden opportunity and started aggressive marketing in all the possible platforms including buying IPL promotions which assists them in acquiring a lakh of user every day. The company has more aspirations from the upcoming World-Cup to achieve its target of 100 million user base by year-end. Dream 11 is not marketing on a hundred categories of promo codes despite they are targeting specifically to promoting referral user base. This promo code gives the new user a referral amount of 100rs to start betting with, that implicates mouth to mouth publicity and gives a free hands-on to the first-time user, the amount is even enough to play 3-4 times and there is a great chance after that for the customer to becomes loyal. People inspire from one who is like them, Dream 11 which is very active on digital platforms showcasing their customers who have earned lakhs of rupees or a 1st prize winner with the name and his/her photo. Also, they felicitate winners in the post-match presentation ceremony which create high aspirations and engagement among the customers.